Chicken and waffles never looked so good. Actually it's not suppose to look good. Those eagerly awaiting the arrival of Gussie's Chicken & Waffles will have to wait another week, at least. The Fillmore neighborhood soul food joint from Michele Wilson (a veteran of Roscoe's) was supposed to debut Monday, but as happens, it has hit a few more snags. The new plan is to softly open to the public next Monday at 1521 Eddy St. in San Francisco. Kindly update your almanacs. 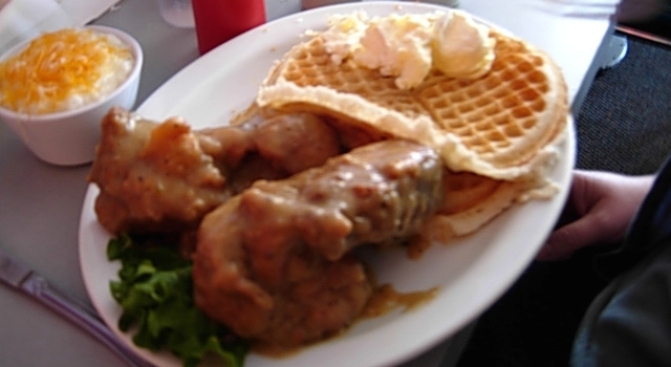 Gussie's will feature several types of homemade waffles -- buckwheat, banana pecan, sweet potato, and buttermilk -- the latter two of which are served with up to half a succulent n' crispy fried chicken and smothered in gravy and onions (optional). While the former go better with fresh fruit and maple syrup, according to the menu. Eater SF and Thrilist contributed to this story.